A couple of weeks ago I was at a cross country ski camp in Bruksvallarna(Sweden) with my team and a few other kayak teams here in Sweden! It was the first time I have been cross country skiing and now I love it! We were there for a week and had two hard practices everyday. 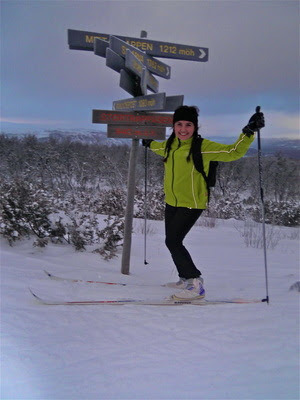 The morning practice usually consisted of long distance, we skied up Sweden's longest uphill ski trial and it felt amazing to reach the top, and the view was simply breathtaking! Then at night we did a whole lot of technique drills, and races! Unfortunately we didn't get in any cross country skiing practices before the camp because of the unusual "warm" winter for Sweden with an average of about 37 degrees fahrenheit. It sure feels like winter to me! the ice next to the dock and then we were ready to paddle away! 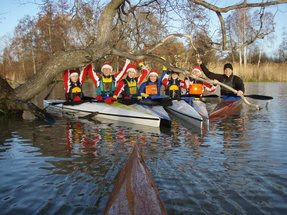 And our Christmas day paddle even made the paper. (See in the attachment). I hope you all had a great holiday season and now I wish you a very Happy New Year! !